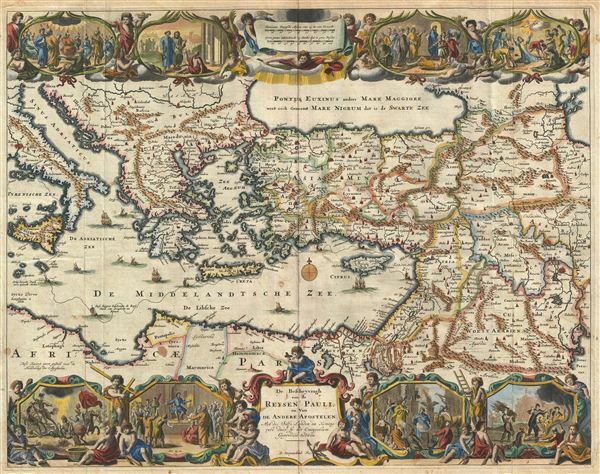 This is a splendid early example of Daniel Stoopendaal and Jacob Keur's 1702 map of the travels of the Apostle Paul. The map covers the eastern Mediterranean from Sicily to the Holy Land and inland as far as the Persian Gulf and the Caspian Sea, including the modern day countries of Israel, Palestine, Cyprus, Jordan, Lebanon, Syria, Turkey, Italy, Georgia, Armenia, Egypt, and Iraq. The travels of Paul between Canaan and Italy are illustrated with a dotted line. This map is derived from Nicholas Visscher's 1645 map of the same name, and though cartographically nearly identical, features updated decorative elements. These include scenes from the life and travels of the Apostle Paul. Just to the right of the title cartouche a there is fisherman holding an anchor – a nod to Visscher who used the 'fisherman' iconography to represent his patrimony. This map was published by the Keur family in their popular Keur Bible. As one of the Dutch 'Staten Bibles' published between 1637 and 1760, the Keur Bible contained five or six maps: Werlt Karte, Paradys, Perigrinations, Canaan, Ierusalem, Reysen Pauli, and sometimes Reyse der Kinderen Israels. This specific map was issued in the1702 edition of the Keur Bible. Very good condition. Original folds. Platemark visible. Text on verso.